This reminds me of my first FM microphone transmitter. I couldn’t get the frequency right by moving the coil turns, but i was able to fix it by putting a screw near it. I like the idea with the wire that keeps the screw in place and allows precise movement. During the 1950’s, many auto radios were permeability tuned. The RF, Oscillator, and Mixer input coils were mounted on a sturdy immoveable mount, and the iron core slugs were mounted on a moveable bar. The selector push buttons moved the bar, which tuned the stations. This worked quite well, because it required much less space, and was less prone to shock and vibration, than was a variable capacitor. Since the advent of tuning diodes and phase locked loops, horrible image rejection and terrible IM distortion has become the norm for auto radios; both AM and FM. Satellite suffers from yet another problem; increasingly narrowed bandwidths, to accommodate the proliferation of increasingly shallow and uninteresting programs..
Soldering on an altoids box would probably either take a soldering station capable of high temperatures or one of those >100W plumber’s soldering guns. Steel works fine, a metal with a higher permeability might make a smaller coil possible, but this really isn’t necessary when the coil isn’t the limiting factor on the size of the final product. Drake Amateur Radios used a PTO. 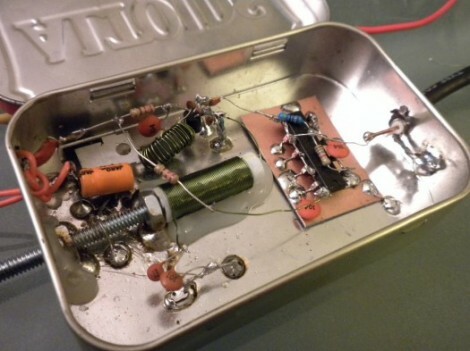 @Bogdan, @Squirrel – soldering to that box was easier than I thought! (first time I did it) It helped to scratch the surface of the box before soldering to it. I used a small Weller iron at 60W – the same one I use to solder all my electronics. Keep in mind the ‘hack’ is making a pretty darn good wide tunable oscillator with parts you likely already have in your junk box! There are better ways to do everything with more expensive or specialized components. Nice write up of the project. I like seeing RF project While I understand that this was a from scratch experiment, older car radios are a source for the adjustable core devices. Old being a relative term. The 70’s/’80s bargain brand auto after market radios used PTO. AFIK they where/are trouble free. Bogdan IMO the tool box of every DIYer should have at least the 140 aw. Weller soldering gun. Amazing what you can solder if you have enough heat, and develop the knack for controlling the heat. Also handy for soldering tabs on rechargeables. Li-Ion OTOH = BAD idea, best to leave these to the spot welder. LiFePO4 aren’t so bad if you are careful and use a good heatsink so that the delicate seal at the top of the cell doesen’t get damaged. Trust your gun. I even so surface work with it. Click click…..click click etc. The best pitch bender I have ever played is the one on my cheap Casio where I replaced the damaged tuning coil with an old car radio coil and the slug end is moved by a stiff leaf spring that protrudes from the case. Pitch at rest is stable and tuned with a variable cap. In the design there is no dead zone like all pro junk. Vibrato and bends are all in one lever, no LFO crap. Does anyone have references to a simple DIY design for an AM/VHF pto receiver? Coils, though certainly not ferrite style are still used in GDOs. They have plug-in coils for the bands.